he BL9L features high luminous efficiency, a life span that reaches 50,000 hrs, amazing wide current working range, and very low power consumption. The casings are Waterproof(IP66), vibration-proof, Energy-saving, Environment-friendly, and manufactured with naval bronze for the harshest environments: tested in fresh water, salt water, and brackish water. 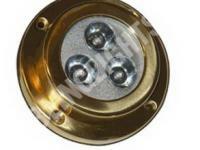 If you are looking for the best in underwater marine LEDs; then you have come to the right place. 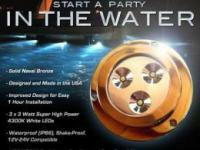 BlingLights BL9L Naval Bronze LED Under Water Light features 3 x 3 watt LEDs in water proof naval bronze casing. 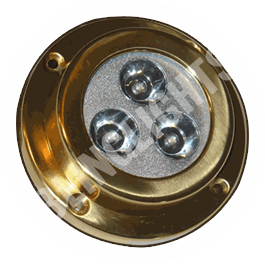 This surface mount LED is easy to install, and only requires a 3/16" hole for wiring. Our underwater boat LEDs are super bright, and will light up to 70' of water (depending on water clarity) behind your boat in 180 degrees. 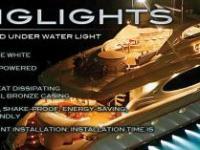 These underwater marine lights were designed by BlingLights to out perform all other brands in brightness (Lumens), power consumption, heat, and ease of installation. Underwater boat LEDs mount to the rear wall (transom) of your boat under the water line, and illuminates a natural sunlight pure white 4300K output that will attract all types of marine life. Unless stated otherwise you may return most new, unopened items within 10 days of delivery for a full refund. If you need to return an item, simply login to your account, view the order using the "Complete Orders" link under the My Account menu and click the Return Item(s) button. We'll notify you via e-mail of your refund once we've received and processed the returned item. If for whatever you cannot log in to do this, please send an email to sales@blinglights.org with your order # in the subject to request a return. Return shipping is paid for by the customer. If returns are sent without authorization (RMA) we will issue a 20% restocking fee, which will be deducted from the refund.